Art: the expression or application of human creative skill and imagination, typically in a visual form such as painting or sculpture, producing works to be appreciated primarily for their beauty or emotional power. 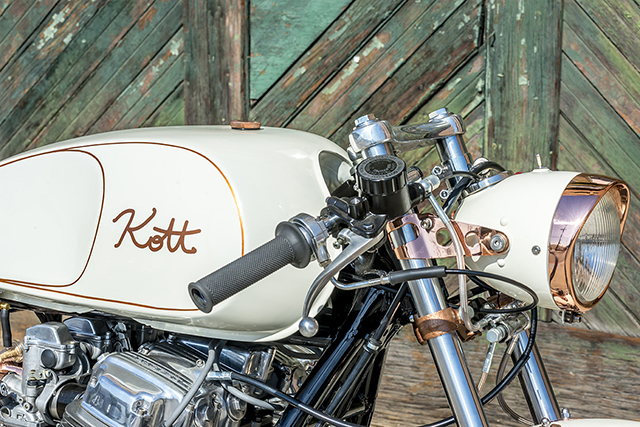 An apt description for today’s feature bike, except that the latest release from Kott Motorcycles isn’t just built for show. 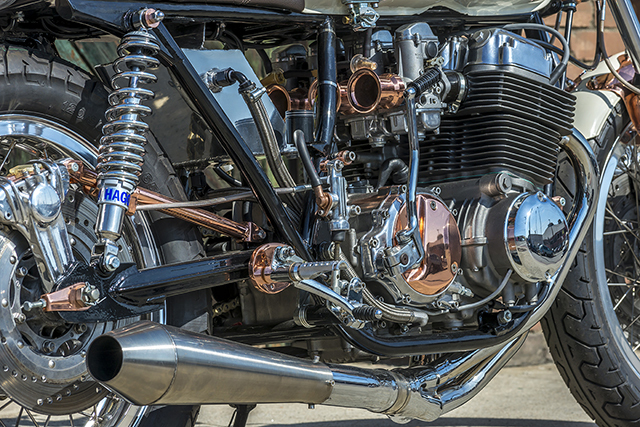 A 1971 Honda CB750 built literally from the frame up, this automotive art piece has been engineered to look good and go hard, with engine power to match an aesthetic that belongs in an art gallery. 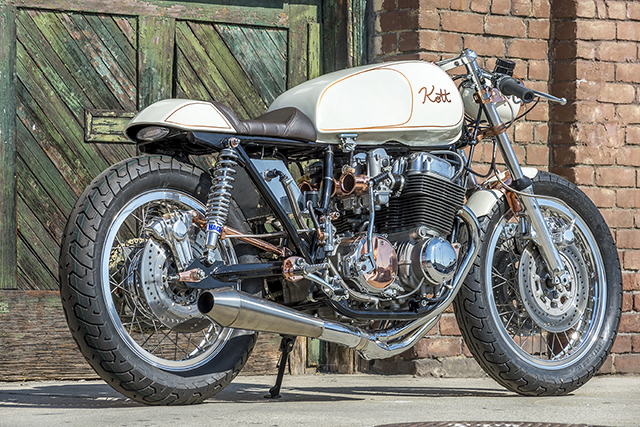 The almost ubiquitous CB750 making for an excellent platform to build a café racer on, the Kott workshop has taken the build quality to a new high and produced an amazingly clean motorcycle. In Dustin Kott’s own words: “the opportunity arose for the shop to implement some performance and aesthetic enhancements that had not been utilised prior.” Came up pretty good for a first time try, don’t you think? 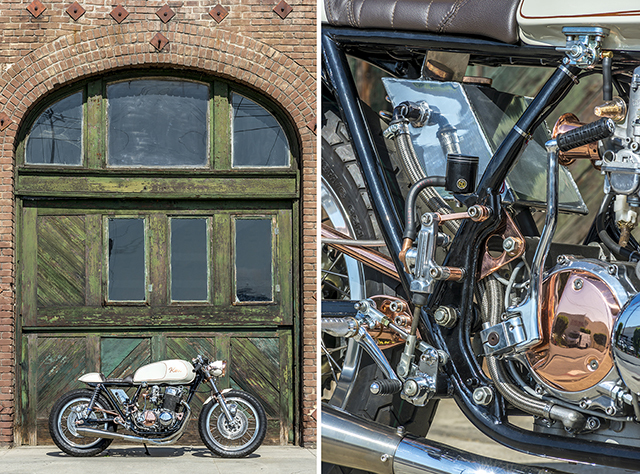 After happening upon a ’71 CB750 in poor shape, the bike was assessed and found only two components could be rescued. The frame and the bottom engine case are the only remnants of the original bike, but as any good bike builder knows: you work with what you got. The engine was built up again, and blown out to 820cc from the factory 736cc displacement. A moderately aggressive camshaft helps boost the ponies available, while the engine breathes out through a 4-1 collector into a Dunstall style silencer. A set of reconditioned carbs were sourced, and velocity stacks mounted to keep the in frame area looking neat and uncluttered. And cos they look pretty damn cool. 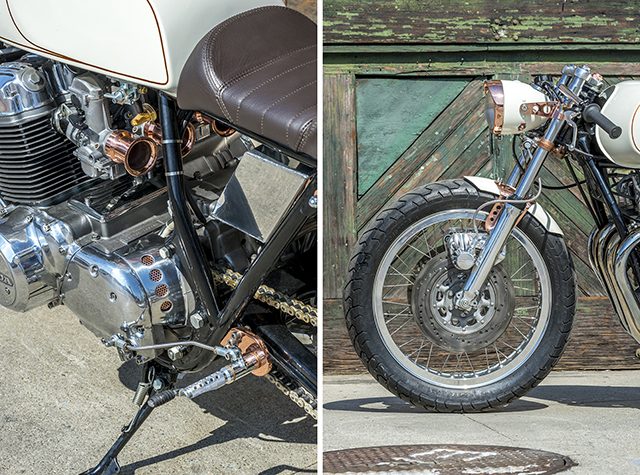 Also mounted inframe is the custom oil tank, fashioned to follow the lines of the naked frame. To achieve a unique look, electro-plating has been utilised during the build. 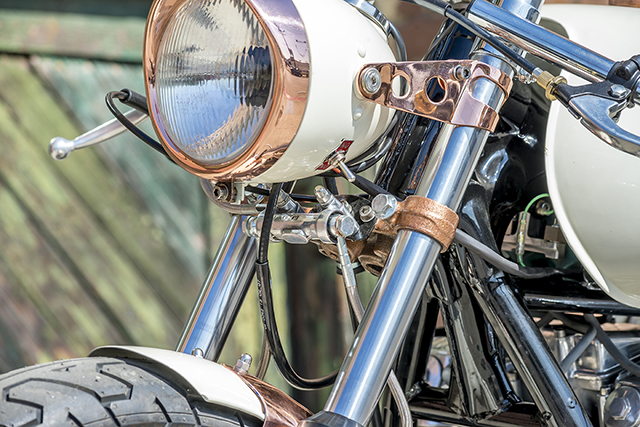 Copper highlights punctuate the bike’s tastefully finished lines, without being too steampunk to take away from the build. The rare Italian headlight didn’t avoid the vat either, but the elongated lamp suits the lines of the bike, smoothly flowing along the outline of the Yamaha XS1100 fuel tank. 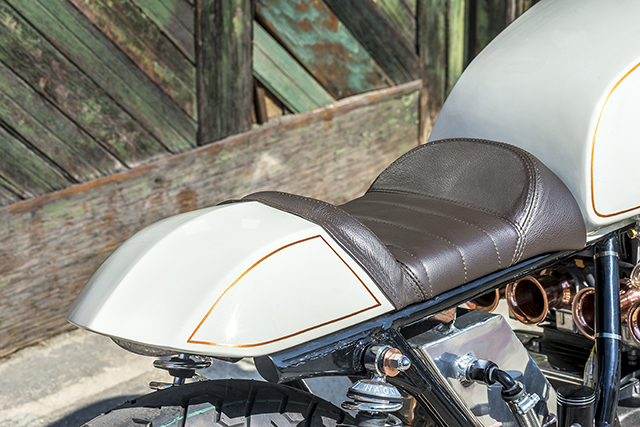 A hand-formed seat rounds out the body work, mounted upon it a walnut brown seat. 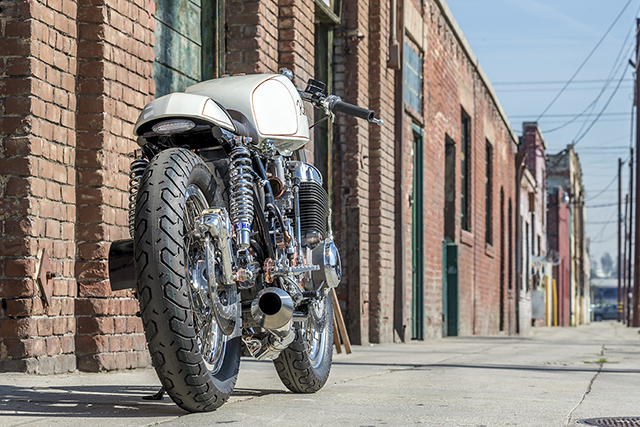 The paint chosen for this build was inspired by the paint code from a 1963 Ford Galaxie, a color option known as ‘Wimbledon White’, with gold pinstriping to break up the pallid tank. For rolling stock, a set of Excel shoulder aluminium wheels have been laced with custom stainless spokes. A triple rotor brake setup has been fitted, the front end packing a custom fit dual banjo manifold, while the rear has been specially designed with a modern master cylinder and remote brake reservoir engineered into the right hand rear set. 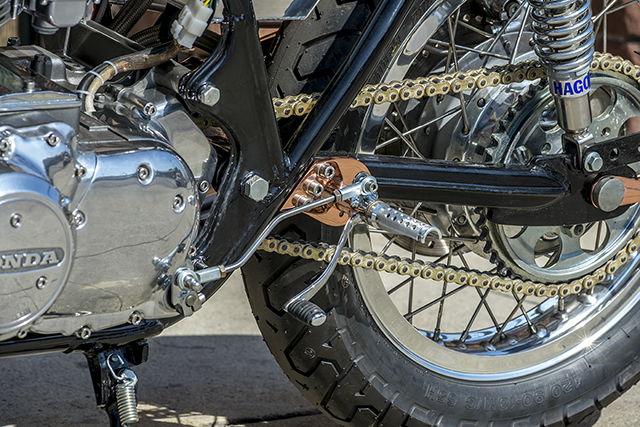 Drilled rotors add to the sporting look, a shortened and lowered front guard hugs the rubber of the front tire.